I hope you all had a lovely weekend! Ours was filled with family dinners, cool weather, pumpkin picking + Clemson football and I couldn't be happier about it. Isn't this time of year just the best? I feel like everyone is officially over the heat and anxious for the leaves to start changing. After the hubs and I picked out a couple of pumpkins for our front porch Saturday morning, it inspired me to pull out a few fall decorations to sit around the house. There's nothing better than a nutmeg scent burning + a little candy corn. So, I have a slight major obsession with two things so far this season - gingham anything and sweaters. I love the asymmetrical zippers on this tomato colored sweater. It just gives it a little something extra. I also just bought this gingham shirt that I plan to layer with a lot this fall, as soon as the weather gets just a little cooler. This is my favorite time of year to shop at J. Crew - so much layering perfection! As always, thanks so much for stopping by, xo. Love how your sunglasses match your clutch! You are seriously my fashion blogger idol!!! :) i love this look on you! I love this look! That sweater pairs perfectly with those booties and that gorgeous leopard print clutch! I love it! So cute and comfy! Love how simple this look is. Love! I have those same jeans and they are so comfortable and I love the distressed detail. 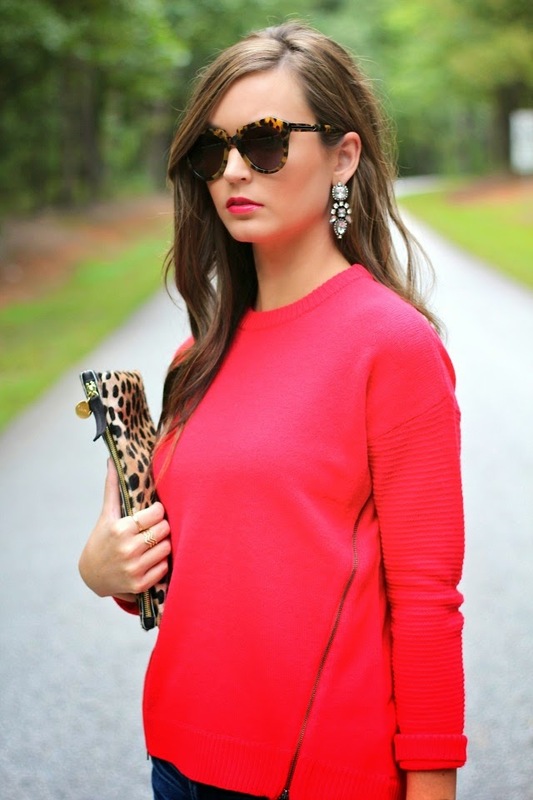 You look amazing in red and I love how you paired a leopard clutch with it. Leopard and red were made for each other. The color of your top is so pretty. I love it on you! Great Fall look. Love that color on you! Great classic pieces with fun, chic pops of LOVELY! "MAKING IT EASY TO OWN YOUR RUNWAY!" LOVING this denim! Casual, stylish and CHIC!